Five Finger Death Punch (also initialized as FFDP or 5FDP) is an American heavy metal band from Los Angeles, California. Formed in 2005, the group's name is derived from classic oriental martial arts cinema. The band originally consisted of vocalist Ivan Moody, guitarist Zoltan Bathory, guitarist Caleb Andrew Bingham, bassist Matt Snell, and drummer Jeremy Spencer. 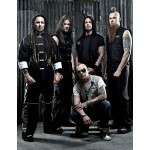 Bingham was replaced by guitarist Darrell Roberts in 2006, who was then replaced by Jason Hook in 2009. Bassist Matt Snell departed from the band in 2010 and was replaced by Chris Kael in 2011. Their debut album The Way of the Fist was released in 2007. Following its release, the band began achieving success rapidly. The 2009 follow-up album War Is the Answer further increased their popularity, leading to both of the albums being certified gold by the RIAA, selling over 500,000 copies each in the United States. The band's third album, entitled American Capitalist was released on October 11, 2011 and achieved Gold status within the year. The band has played international music festivals including Mayhem Festival in 2008 and 2010, and Download Festival in 2009, 2010 and 2013. Five Finger Death Punch are the recipients of the Radio Contraband Rock Radio Awards for "Indie Artist of the Year" in both 2011 and 2012. They were also honored with the Radio Contraband Rock Radio Award for Album (American Capitalist) and Song of the Year ("Coming Down") in 2012.